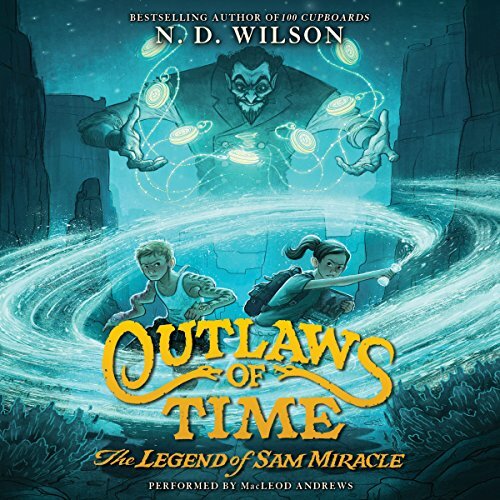 This new fantasy-adventure series from N. D. Wilson, best-selling author of 100 Cupboards, pits a misfit 12-year-old against a maniacal villain with a deadly vendetta. This one-of-a kind story is a must-listen for fans of Brandon Mull and Soman Chainani and the start of a thrilling tale from a masterful storyteller. Sam Miracle's life is made up of dreams - dreams where he's a courageous, legendary hero instead of a foster kid with two bad arms that can barely move. Sometimes these dreams feel so real, they seem like forgotten memories. And sometimes they make him believe that his arms might come alive again. But Sam is about to discover that the world he knows and the world he imagines are separated by only one thing: time. And that separation is only an illusion. The laws of time can be bent and shifted by people with special magic that allows them to travel through the past, present, and future. But not all of these "time walkers" can be trusted. One is out to protect Sam so that he can accept his greatest destiny, and another is out to kill him so that a prophecy will never be fulfilled. However, it's an adventurous girl named Glory and two peculiar snakes who show Sam the way through the dark paths of yesterday to help him make sure there will be a tomorrow for every last person on Earth. I know this is supposed to be for tweens, but the writing is excellent and the subplots are nuanced so that adults will enjoy this too. And the performance was outstanding. N. D. Wilson has done it again!! This book was awesome! I am looking forward to the next one in this series!! Enjoyed this story, lots of adventure & action! Even in fiction written for adults, it's hard to find characters to care about and a story to get lost in. But, eureka! I really enjoyed this story. The idea behind it was a fun twist on time travel. Not loving that it is a series. I was hoping for a conclusion at the end of the book. Amazing!!! One of my favorites!!!!!!! I adored this book because of the reality and imagination! I recommend it especially to 8 year olds and up ! It is fast-paced , adventurous , and gives you a lot to think about. This is worth re- reading again and again!!! I don't usually go for the type of books where things that could never happen are written, but I have really enjoyed this book, and look forward to listening to the next one!!!! P.S. The reader of this book was perfect for the story! This is one of my favorite books ever. I listen to it all the time. My family and I loved this story, so we choose this audio book for a road trip. the performance was worthy of the story... well done!